The HT-X200 is quite possibly the most gorgeous 2.1-channel system we've ever come across. The main unit, which can be mounted horizontally or vertically, boasts a sleek curvy black design and displays text in large blue letters - all of which makes it stand out from the crowd. The stereo speakers are small satellites, equipped with a pair of mid-range drivers and a tweeter. 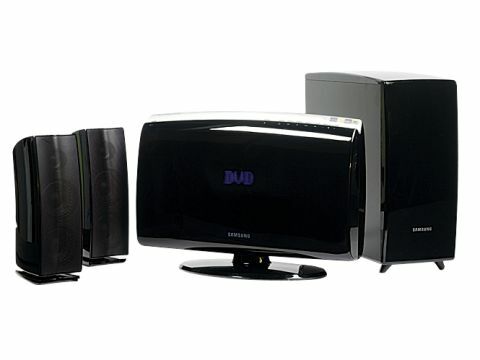 The sub, meanwhile, has a sound-mounted driver and is styled to match the main unit. Connections include an HDMI output, which delivers crisp digital images to your flatpanel TV, plus a side-mounted USB port for playing back DivX, JPEG or music files from an external device. The system will upscale video to 720p and 1080i, and boasts two virtual surround modes designed to widen the soundstage for more engaging movie playback. Setup and operation are extremely easy thanks to features like colour-coded cables and a well-designed remote. And on the picture front, the HT-X200 is a sterling performer, helped in no small part by the all-digital HDMI connection. Detail and colour reproduction is strong, and the lack of noise gives the image a clean appearance. The upscaling is decent too, although the benefits over a normal standard-def picture are minimal. Component video and RGB Scart pictures are also impressive, should you need to use one of the analogue options. Sadly, the Samsung system can't marry its excellent picture performance with decent audio. During 300's noisier passages, the subwoofer fails to add enough boom to the bottom end, resulting in thin-sounding, isolated effects and an over-emphasis on the harsh-sounding higher frequencies. Another disappointment is that the soundstage doesn't mesh together into one coherent whole. Judging by the quality of its design and picture quality, the HT-X200 could have been something very special. Unfortunately, it's let down by poor sonics, making that £350 price tag a bitter pill to swallow.